The screenshot above shows how I geoencoded the images in yesterday's post about a train and boat ride. Update: both Lightroom and the plugin mentioned in this post have grown and matured considerably since this post was written. See the plugin's home page for a more-current presentation of this plugin's many powerful features. 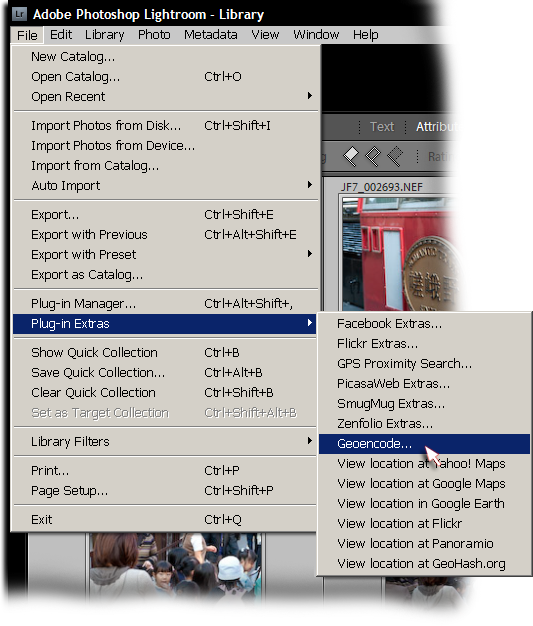 Today I'm releasing a beta version of a new plugin for Adobe Lightroom, “Jeffrey's GPS Support”, that adds support for Geoencoding photos from within Lightroom. There are more features yet to add, but it's already polished enough for daily use, offering even the ability to geoencode speed and bearing. 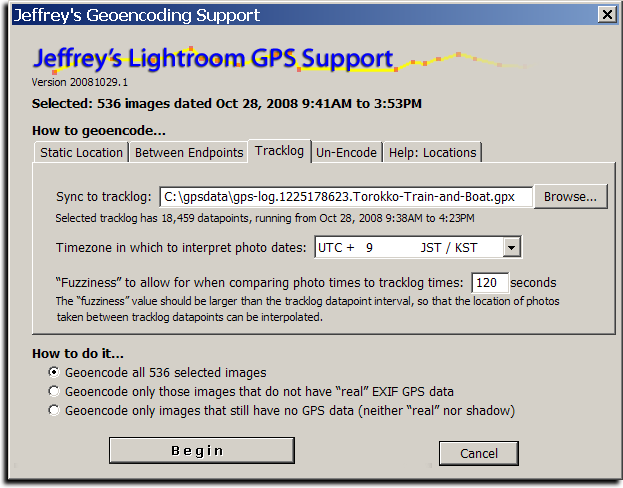 Sadly, Lightroom does not allow for a plugin to easily update the “real” per-image GPS information in the Lightroom database, but this plugin takes an approach that should allow geoencoding to be seamless for many. The plugin itself maintains its own set of “shadow” GPS data for each image, allowing you to view and change the data as you like. On export, the plugin inserts the GPS data into the image (into the copies of the images made during the export), so that your exported images are properly geoencoded as well. This brings up the screen shown at the top of this post. You can encode from a tracklog (a GPX file), or you can specify a static location to assign to each image. You can also geoencode between two endpoints. See the “Help:Locations” tab in the Geoencoding dialog for more examples. 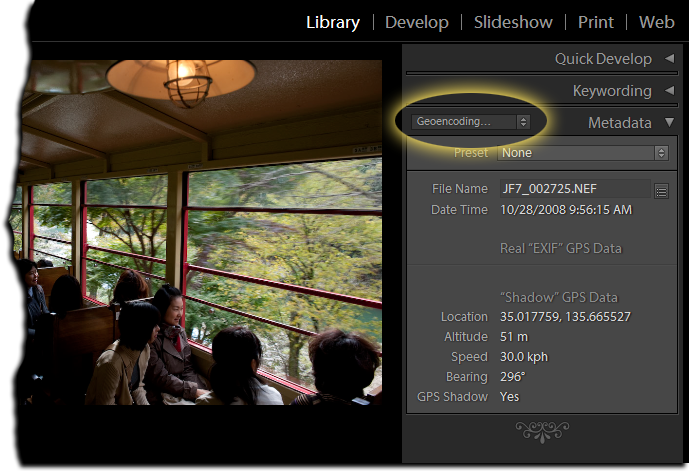 In the screenshot, the lack of data below the “Real EXIF GPS Data” header means that the image was not geoencoded prior to being loaded into Lightroom, and so Lightroom's library has no GPS data. If you only ever geoencode with this plugin, that section will always be empty. I place it there, though, so that those who previously geoencoded their images with other methods (prior to loading into Lightroom) will be able to use the same metadata preset to view an image's geoencoded data. NOTE: There seems to be a bug in Lightroom that causes the shadow data in the “Geoencoding...” section to sometimes not appear. Sometimes it does. It's very frustrating. (See this comment). If it's not showing up, try switching to the “All Plug-in Metadata” view. Once turned on, it is active for every export, including my “Export to...” plugins for Flickr, Zenfolio, SmugMug, Facebook, and PicasaWeb (all available on my Lightroom Goodies page). Note: if you have export presets, you'll want to rewrite them with this post-process action turned on. That means selecting the preset, clicking the checkmark as highlighted in red above, then right-clicking (or option-clicking on the Mac) the preset name and selecting “Update with Current Settings”. This plugin's geoencoding is understood by my GPS Proximity Search plugin, as of version 20081029.3. It still understands “real” geoencoding as well, but gives preference to the shadow data when an image has both. Also, note that I removed the “View location in...” menu items from the proximity-search plugin and brought them here, as well as added a bunch of new ones: Yahoo! Maps, Google Maps, Google Earth, Flickr, Panoramio, and GeoHash.org. These, too, now understand both kinds of GPS data. The ability to read a tracklog directly from a GPS unit. I'd love to hear more ideas as well, if you have them. Only one point: When you use the ‘Copy from above’ or ‘Copy from below’ buttons not only the locationfields are copied but also the coordinates. That’s not always wanted (not by me anyway). Can’t you provide a checkbox or so to include/exclude the coordinates when you copy the locationfields. Are there any plans to integrate Google Maps directly so that no copy paste is necessary? Would be great to set just a pin on the map for a set of photos (like iPhoto or Aperture 3). 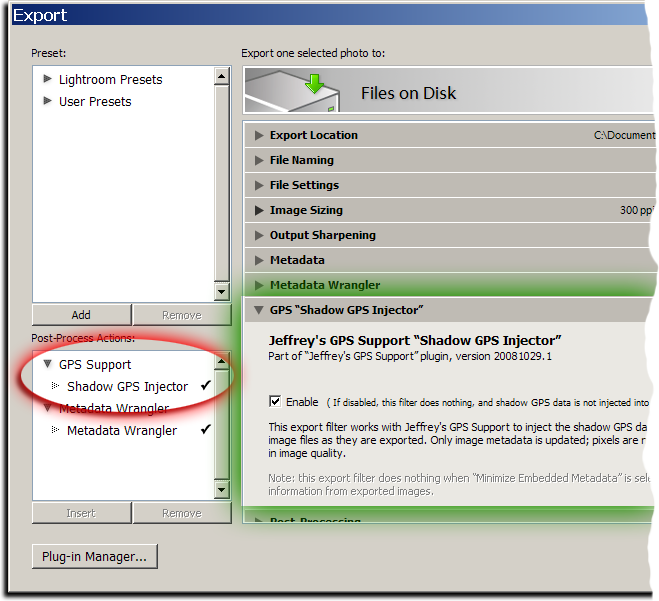 Where is the GPS shadow data stored if I do not export the image? It must be somewhere in the Lightroom database. If I have images stored as JPEG and export at 100% in order to write the GPS info, won’t that be a JPEG resave that will cost me some amount of quality? Thanks for a plugin that looks impressive and hopefully will deliver lots of joy still for me! As for now, I’m getting the “Datapoints in that tracklog don’t have timestamps” error message that others have reported about in earlier versions — I’m running 2000317.115 on my Mac. I’ve tried GPX files created both by “Time Album v. 1.7.1”, a JAR app belonging to my GPS tracker Columbus V-900, and a GPX file created from GPSbabel+ 1.3.6. I have exactly the same problems than Kaj Arnö. I also use the Columbus V-900 and work on a mac. When I look in the file with an text editor I think I see timestamps. Do you have a solution meanwhile for that problem? I have discovered the delights of the preset section on page one of the Geoencode plugin. I have a question on its behaviour. I travel to several places and have saved waypoints for various places (streets where GPS does not work). I have discovered the file format for the presets in Geoencoding and tried to make several sets so I could load individual sets (e.g. Spain, UK etc). However, the presets are additive and I end up with a great big list. Is there a way to “unload” the presets so I only load the ones I need? By the way I am mostly using the LR3 Beta 2 with Geoencoding and have yet to have any issues. The reason for this approach, is my photo GPS doesn’t work with Windows 7, so I have to book Ubunti, fetch the files off the device, and reboot. As a result, I end up with a giant folder of GPS log files which sometimes don’t get applied to the photos as contemporaneously as they ought. Thanks for a fab plugin. Hi – firstly, thanks for great plugins. I donated to you for the Geoencoding in LR plugin and received an unlock code a long time ago. I recently upgraded to LR3 and it seems like I need the code again – do I need to make a new donation for the plugin to be active in LR3? If not, how can I get my unlock code again? Thanks. One comment from a Nikon/View NX user perspective. Nikon supports GPS in camera and writes coordinates into EXIF. Often enough however, GPS isn’t quick enough to lock and register before I push the shutter release. View NX allows to cut and paste GPS data from one image to a selection of other shots with two click action. This is probably the only feature I am missing from your otherwise excellent plugin. Again as an option being able to automatically write to XMP sidecars, so I don’t have to click another tab and another button. – any difference if using Nikon own GP-1 or some external device? – if using Nikon GP-1 it writes gps info to the image files so is this plugin needed? The two points are separated by 16 meters (17 yards). I’m wondering what would cause this? Is the GPS unit getting confused, or is it just not creating datapoints often enough? Hallo, i’m coming from germany and my englisch is not good. Today i have installed this great plugin, but i have a problem. I can see the gps data, gps shadow says yes, but i dont see the region, town , country. I would also like the ability to tie a Sublocation/City/StateProvince/Country to a GPS coordinate. I agree that it will not be accurate, but at least, when I export images from LR into a photo-application (like on the iPad) that supports showing photo locations on a map, those images would be included. How to fix that? Am I doing something wrong? Thanks, it was – surprise surprise – yet another windows-problem. Thank you for this great plugin, works great! Are you planning to support Gisteq loggers as well? And further more do you any good layouts / templates for creating web galleries that show a (google) alongside the photo’s? At the moment I’m using JetPhoto for this. But would be nice to be able to do this all inside Lightroom. I apologize if this has been covered in the multiple pages of comments, but I have been checking out your GPS encoder, which I absolutely love. (I have been using Geosetter, so I still don’t know what is different between yours and it, but I love your other plugins) Anyway, what I was wondering is how to Reverse Geoencode multiple images (without producing a bulk reverse geoencode) For instance if I’ve been out shooting and come back I’d like to select all photos, and then go to the “Interactive” tab and click on “Open Interactive One-by-one Geoencoding and Reverse Geoencoding Dialog” and then I wish there was a “Click all City, Etc…from GPS” button, instead of having to click through each photo to reverse Geoencode. Obviously, if I click “Bulk Reverse Geoencode” it will mark all of my photos as if they are in the same location, which may not be the case. Any help or future time saving tips are welcome. “Bulk Reverse Geoencode” treats each photo individually. The second suggestion has to do with once you have clicked the “City, Etc… from GPS” button within the “Interactive” tab, I wish that the address that typically populates above the “Location” block would automatically fill in the “Location” block. Right now I am having to manually highlight the address, and then copy and paste it into the “Location”block. Any help or future time saving tips are welcome…. Thanks again for all your help and plugins…..you truly have a passion that is inspiring to many across the world. Keep it up! Hi – I am looking in to various options for adding geotagging to my photos in LR3. I see that there are several iPhone apps for this in addition to your LR plug- in. What are the pros/cons or differences of your plug in vs GPS4cam or Geoagphotos apps? I am just looking for easiest way to do this as part of my LR3 workflow. Thanks. Wow! I’ve been thinking about something like this for a while! I have no coding experience, but what I do have is tens of thousands of photos that i have taken on hikes and the corresponding GPX data from my Garmin! I love you! I can’t wait to try this!!!! I have been using both your GPS-Support and Proximity search plugins, I love them, they are so useful, I just have one question. Is it possible to clear the GPS shadow data? some how I seem to have added the same location to all the images in my LR catalogue and now I can’t export the locations to google earth. I tried using GPSBabel on my Mac using the Config option. I installed the GPSbabel.dmg successfully. However when I select the GPSBabel file, the plugin rejects it saying it’s not the valid executable. thanks for yet another great plugin! As far as I understand, you match a photo’s timestamp to the trackpoint with the “closest” timestamp. Well sometimes you don’t have a gps reading or something else happened (run through a tunnel, ride a train whose windows dont allow gps reception, …) and you might end up having hours without trackpoints. b) Is there a way to get the location info (populated via reverse Google geo server) into the keywords? c) Maybe b) can be expanded with a config dialog, as in which field goes where in the keyword tree. Example: I use Word location | Continent | Australia | Far-North Queensland | Cairns, compared to AU| Australia | Cairns. To come back to this great plug-in… it demonstrates how some simple lon / lat information can become so much more with all the linkages you have established. Simply great work!! As for a) I thought the GPS log contains the right time; when adding the GPS coordinates it could update the time stamp at the same time, based on the “Compensate for the camera’s clock” value (not the fuzziness value). More detailed: I already know the compensation value; why use LR to adjust, when I geo-encode and know the difference that need to be applied. When you say: “The “compensate…” option in the tracklog tab is for people too lazy to do it the right way.” Are you implying that I should change the time of the images first (after I have established the time difference), and then use your plug-in to add the lon/lat? I am a refugee from Microsoft Pro Photo Tools which has recently stopped providing reverse GPS (at least for me). I used it because it was the only product I could find that provided street level information. After a mostly fruitless search, I found your LR plugin. Wonderful! However, I have a suggestion. You fill out the sublocation field as the entire “address”. What I want and need is only the street level address part, like Pro Photo Tools did. Geosetter also only puts the lowest level information there (sometimes useful but mostly just a repeat of the city). I have a number of scripts that rely on these all being parts of the total address, which of course could be rewritten with some effort. But mostly I don’t believe this concatenation is what sublocation should contain. Thanks for all your work to provide much-needed tools for Lightroom! I just installed your plugin in LR4.Then I was able to transfer GPS data from my “i-GotU” to my shots (NEF files) in LR4. You have done a great job, and I want to thank you a lot. I have a iPhone App called Geotag Photos Pro by tappytaps.com. The software is supposed to work with Lightroom 4.3., but I haven’t been able to test it yet. Do you, or anyone else, have any experience of the software working with your plug-in? Hi Jeffrey, first thank you very much for your great plugins. I am using LR5 and enabled reverse geocoding. The images that have the GPS coordinates automatically get the city, state and country. They are in italic gray. When selecting Metadata->Save Metadata to File it is actually NOT written to the file. In order for this to work I first need to click on the label for City and select the city, click on the label for State/Province to select the State/Province, click on the label for Country and select the country, click on the label ISO Country Code and select the ISO Country Code and THEN select “Save Metadata to File”.